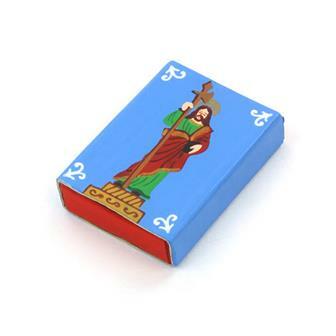 We stock a large variety of Christian items including a huge array of fantastic crosses and cruciforms from around the world. 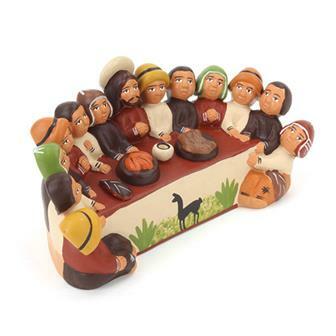 From Peru we also have a great selection of devotional ceramic items like the charming little Biblical scenes or the marvellous Last Supper. 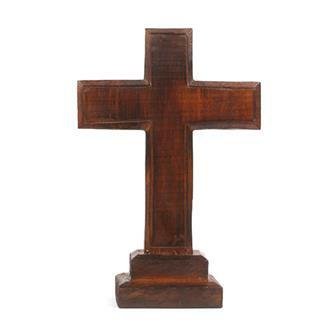 These simple wooden crosses are a plain and unadorned example of the crucifix and are great for a shelf or mantle. 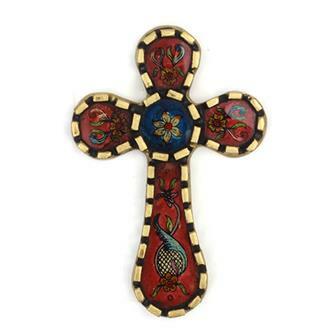 Classy, gold painted wooden cross from Bali. 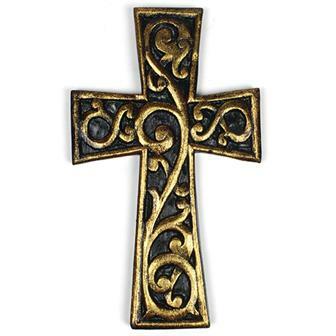 These crosses have been carefully carved into ornate patterns before being given their luxurious golden finish. Beautifully hand crafted Cross, made with a wooden base which is then carefully hand painted and framed with glass for a gloss finish with a small piece of mirror. These crosses are incredibly handsome pieces and would make a wonderful feature on any wall. 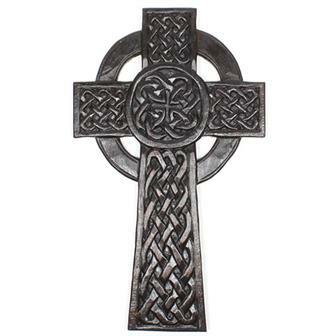 This striking cross has been hand carved in the style of a Celtic cross and features intricate interlace detailing. 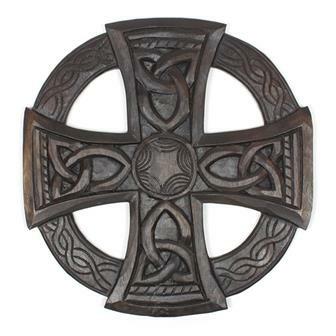 Our Celtic crosses are hand made by skilled artisans on the island of Bali in Indonesia and feature a metal ring on the reverse for the ease of hanging on your wall. 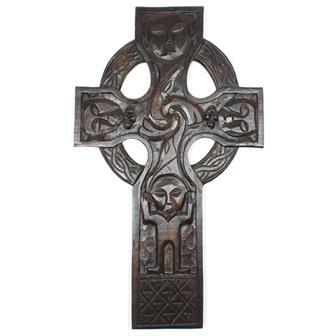 This fascinating cross has been hand carved in the style of a Celtic cross and features intricate details. Carved upon each of the four cross sections it is possible to see four distinct people. 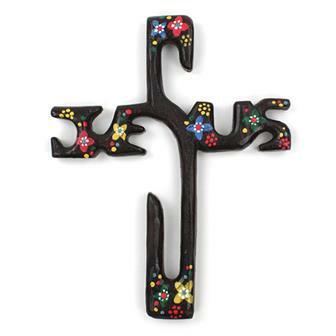 This cruciform has been carefully hand carved in Bali to spell Jesus. With its colourful floral decoration, these make excellent wall decorations. 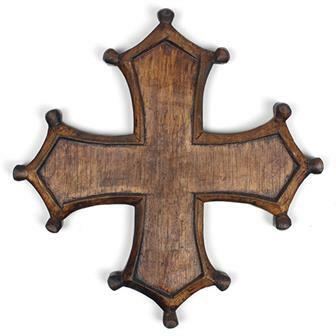 Elegant carved wooden cross with four arms, this simple design has lots of different names; Entrailed Cross, Toulouse Cross, Cathar Cross to name a few. Its heraldic design has the four equidistant arms ending in spear points with "bubs" at the end of each arm which are said to represent the twelve apostles. 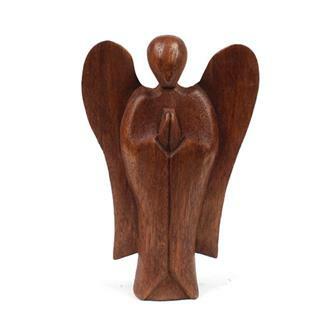 This hand carved wooden Sun Cross is a symbol that has been found as far in the past as the Neolithic period. The "sun cross" or "solar wheel" contains both the symbol for the Sun ☉ with four arms that may represent the four seasons or equinoxes. This cross is decorated with four Triquetra or Celtic knots. 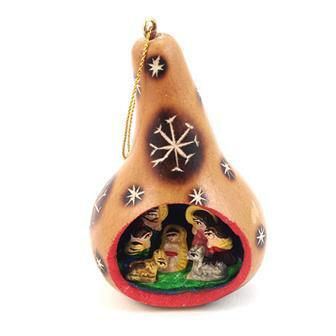 These are absolutely fantastic for the festive season, a mini decorated gourd filled with a tiny ceramic nativity! Each ceramic piece has been hand carved and painted to depict the scene of the Nativity of Jesus. Celebrate Palm Sunday with this stunning depiction of Jesus riding on a Donkey as he enters Jerusalem. 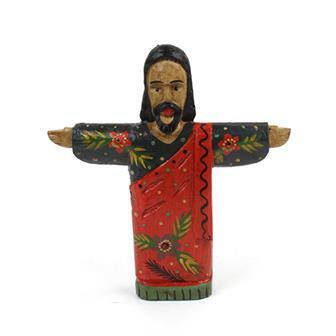 Hand carved in Bali, this depiction of Jesus shows him with arms spread wide wearing a carefully hand decorated floral robe. 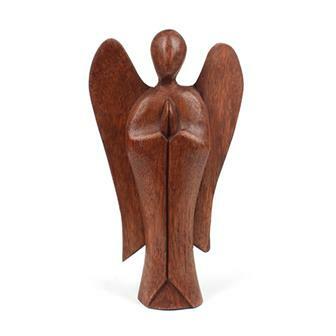 A great looking statue, perfect for displaying anywhere in the home. 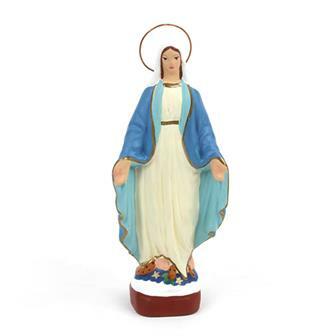 A beautiful hand painted ceramic statue of the Virgin Mother from Peru. Mary has many names including Saint Mary, Mother of God and the Madonna. Both Christian and Muslim scripture state that she became mother to Jesus through Divine Intervention. 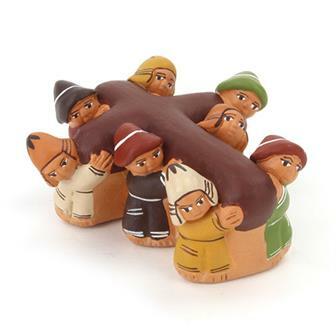 Our talented Peruvian artists create beautiful pieces of ceramic art which combine simplicity with great expressive power, adding a Peruvian twist to traditional Christian themes. 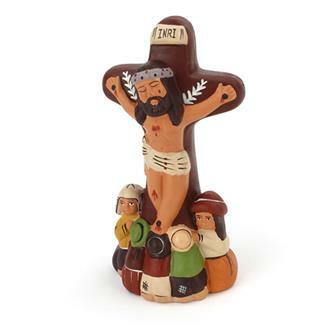 This beautiful hand crafted ceramic figure depicts a scene of the crucifixion cross being carried. Our talented Peruvian artists have taken time to paint this incredibly detailed piece by hand, making each piece unique! 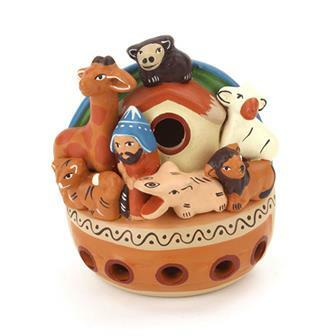 This beautiful hand painted ceramic scene depicts the story of Noah's Ark. 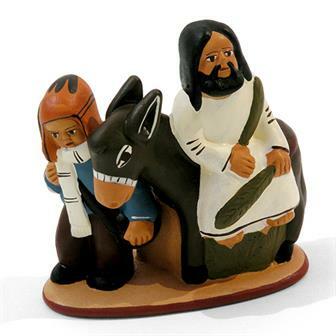 Our talented Peruvian artists create beautiful pieces of ceramic art which combine simplicity with great expressive power and add a Peruvian twist to traditional Christian themes. Beautifully hand crafted and carefully painted by skilled Peruvian artisans, these wonderful ceramics depict the scene of The Last Supper. "And he took bread, gave thanks and broke it, and gave it to them, saying, “This is my body given for you; do this in remembrance of me.” In the same way, after the supper he took the cup, saying, “This cup is the new covenant in my blood, which is poured out for you." Luke 22: 19-20.